Think about spending 13 years in prison. Most of us can't even imagine 13 minutes there. 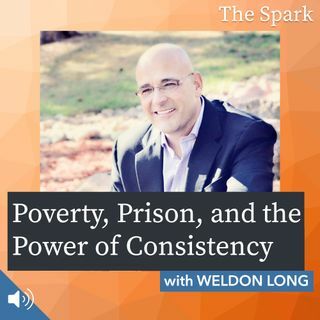 On this episode of The Spark, I speak with Weldon Long, who went through an amazing journey from convicted felon, to total transformation and amazing success in his life. Five years after leaving prison, Weldon became a highly successful businessman, had a wonderful marriage, and most importantly, obtained custody of his son. Today, he has a multi-million-dollar business, national speaking ... See More engagements, and has published several books, including the New York Times bestseller, The Power of Consistency. Changing his thoughts, he changed his feelings, his actions, and his relationship with himself and the world. Join us as we journey through how one man completely transformed his life and how he can help us transform our own. A powerful story that will lend you strength as you travel your own life's path. I wanted to take a moment to let you know that this will be the last episode of The Spark to air on KRFC. I'm thrilled to announce that starting next week, we will be moving to NoCo FM, an exciting new community radio station that can be heard anywhere in the world. The Spark will continue to air at 7pm on Wednesdays, exclusively at www.noco.fm. All of us at The Spark want to convey our gratitude and thanks to KRFC for launching our show and for nurturing it these last 13 weeks. Their experience and leadership has been incredible. KRFC will always be our first home, and we wish them well going forward. But sometimes... you just have to take a leap, and in the sprit of igniting the best life for The Spark, we're looking forward to our new partnership with NoCo FM and a future where we can grow together. Again, new episodes of The Spark will continue to air at 7pm on Wednesdays and we hope you'll join us at our new home: www.noco.fm.